Leukoplakia is a white patch in the mouth. 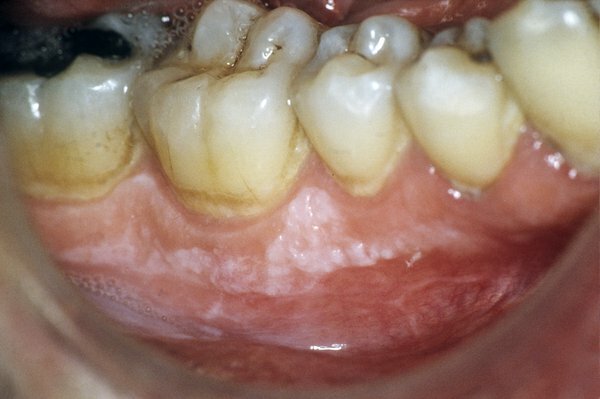 If you have a white patch in your mouth that doesn't go away, get it checked by a dentist or GP. There are also a number of other causes of white patches on the tongue. If you have leukoplakia, there's a small risk that it could progress to mouth cancer over time. This is why it's very important to see your dentist or GP if you have a white patch in your mouth. Your dentist or GP will examine the patch and be able to rule out other possible causes like a fungal infection of the mouth (oral thrush) or cheek biting. You may be referred to a specialist for a biopsy. A small piece of tissue from the patch will be removed and checked for abnormal cells. Treatment for leukoplakia isn't always needed, but you'll have regular check-ups to make sure the patch isn't getting bigger. An operation is sometimes needed to remove the patch if there's a risk it could become cancerous. This may be done while the area is numbed (local anaesthetic) or while you're asleep (general anaesthetic). The patch can be removed in a number of ways, including using a laser or a surgical scalpel. Your mouth should heal quickly afterwards. In the UK, leukoplakia is mostly caused by smoking. But sometimes the exact cause isn't known. There are things you can do to reduce your risk of getting leukoplakia. These may also reduce your chances of getting mouth cancer. Hairy leukoplakia is a type of leukoplakia caused by the Epstein-Barr virus. It often affects people with a weakened immune system, particularly those with HIV and AIDS or who have had an organ transplant and are taking immunosuppressant medication. It causes fuzzy white patches, often on the sides of the tongue, that look folded or ridged. They aren't painful and can't be brushed or scraped away. Antiviral medications, or treatments applied directly to the patch, may be prescribed to treat hairy leukoplakia. Unlike other types of leukoplakia, hairy leukoplakia doesn't carry a risk of mouth cancer.